Oftentimes aquarium employees see the impact of litter on wildlife firsthand. The realities of single-use plastic items can be a hazard for the planet and animals, particularly marine animals. Many aquariums across the country have now banded together to help inform their visitors about the dangers of plastic pollution while also offering easy solutions to the plastic problem. One of the main plastic culprits are disposable bags. These bags are typically handed out at stores all over the country. Plastic bags are seldom recycled. Even if they are tossed in the trash or a recycling bin, they can be lifted away by a breeze. When plastic bags touch down in water it is possible for marine animals to become tangled and stuck in the bags. Some animals may even mistake the plastic bags for jellyfish and unintentionally eat them, which can be a potentially fatal error. Phasing out single-use plastic bags in favor of more durable eco-friendly bags can eliminate these problems. By working to reduce the use of plastic bags, these aquariums are helping to reduce litter and encourage the use of eco-friendly tote bags. The participating aquariums have pledged to eliminate plastic in their gift shops and cafeterias. Each facility will also create an exhibit explaining to visitors how to find eco-friendly alternatives to disposable plastic items from bags to water bottles, straws and more. The goal is to ultimately open up this partnership to zoos, stadiums, and other venues. As leaders in aquatic conservation, aquariums are expected to walk their talk – and that’s exactly what this partnership is meant to do,” said John Racanelli, Baltimore National Aquarium CEO. When asked for comment the Plastics Industry Association had no comment. Visiting an aquarium is a great way to spend a day. It is fun and educational, and now it is also a way to support a great cause. If you live near or will be visiting an area with one of the 19 partnering aquariums consider checking them out. We applaud these 19 aquariums and their forming of OurHands.Org to promote their initiative to phase out plastic and promote eco-friendly bags. Their slogan is “The Solution Is In Our Hands,” and they could not be more right. Consumers holding eco-friendly bags means holding a part of the plastic pollution solution right in their hands. Your business can join with these aquariums and place eco-friendly bags directly in your employees, customers and prospects hands. Request our reusable bag catalog today and be a part of the solution. Image courtesy of Monterey Bay Aquarium. 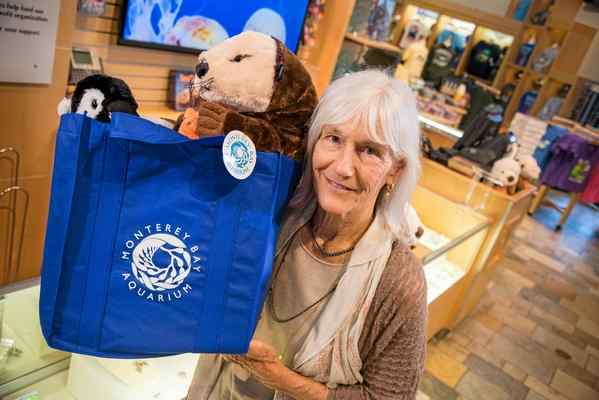 Also please caption the image with Monterey Bay Aquarium Executive Director Julie Packard proudly shows off a reusable bag from the gift shop. Want The Lowest Price on Reusable Wine Totes?